But upon review, isn’t that exactly what you would expect of the God described in the Christian Scriptures? Doesn’t it seem consistent with a God who said “Blessed are you who hid these things from the wise and revealed them to babes” and “blessed are the meek for they shall inherit the earth” and “those who are last will be first” to hide the great pinnacle of his creative glory in an unassuming basal trophic level. My friend Justin has said something like: “the trajectory of the naturalist invariably gravitates from charismatic species to insects.” I have found this to be true. The deeper I get into the ecology rabbit hole, the more entranced I become with insects. Otters and polar bears are the ‘gateway drug’ to the intoxicating world of biological diversity. It is precisely this kind of God who would not ‘dance’ for the miracle seekers and who prefers a measure of hiddeness that would make this unassuming organism replete with wonder. It is precisely the kind of God who counter-intuitively embeds his glory in unassuming ‘jars of clay,’ and who chooses particularly unremarkable human institutions (e.g. the wandering Hebrews in the first testament and the church in the second) to make himself know, who builds the best part of reality ‘just beneath the surface’, whose ‘theme and variation’ artistry would center for nearly a quarter of its production on the most unassuming of his makings. 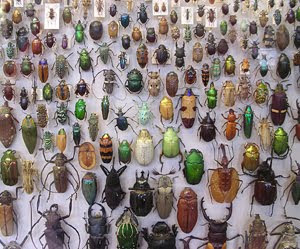 Upon further review, a special fondness for beetles is precisely what I would expect. It is uncited and has been considered apocryphal by some. But Gould devotes an entire essay in Dinosaur in a Haystack to the validation of this quote and generates a compelling body of evidence. If this wasn’t Haldane, it was certainly a ‘deutero-Haldane’, of an ‘editor of the Haldane school’ because it has the right content, tone and vintage. And yes, I am extremely pleased with myself for coining ‘deutero-Haldane.’ That has got to be the best biology IM-sports team name in history. Roughly half a dozen of my professors and introductory texts have related this quote. What most people don’t know is that the other great, early population geneticist R.F. Fisher, (and a professional as well as personal rival of Haldane) was a devout Christian. None other than Dawkins argued that Fisher was the ‘greatest of Darwin’s successors.’ It is often overlooked that the history of evolution is replete with substantial Christian contributors (particularly plucky Anglicans). My area of emphasis advisor in the Ecology department gave a lecture where he discussed the complicated relationship between these two men including a widely believed (though, possibly apocryphal story) that Haldane stormed out in protest in the middle of prominent scientific meeting. Only he had stormed out into a closet. But he stayed in the closet until the room had cleared rather than emerging and admitting his mistake. This is a paraphrase. I couldn’t find the quote. But the insight is his. Paul’s famous description of the Church in 2 Corinthians 4. I am going to see NT Wright speak on Wednesday. I described it to one friend as similar to going to see a band live. I like live shows because they infuse a fundamentally consumerist transaction with a modicum of relationship. They help make art something more human than commerce. Connecting artist and patron in a personal venue enlarges affection and helps the relationship transcend a crass consumer interaction. I feel the same way about authors. In the next year I will probably spend at least another 1,000 pages with Tom. It will help a lot if there is a veneer of relationship there. So I am going to hear our generations most penetrating and affable theologian speak, not as a sort of celebrity chasing, but as a personal subsidy to our already substantial (though asymmetrical) relationship. "That Dust itself which is scattered so rare in Heaven, whereof all worlds, and the bodies that are not worlds, are made, is at the centre. It waits not till created eyes have seen it or hands handled it, to be in itself a strength and splendour of Maleldil. Only the least part has served, or ever shall, a beast, a man, or a god. But always, and beyond all distances, before they came and after they are gone and where they never come, it is what it is and utters the heart of the Holy One with its own voice.... Each grain, if it spoke, would say, I am at the centre; for me all things were made. Let no mouth open to gainsay it. Blessed is He!" I used to wish I had been born 300 years ago, when there were still unexplored frontiers on earth. And then I started studying insects. [B] Or maybe He just really is just inordinately fond of beetles. And why not? That has got to be one of the epic blog comments of all times: for its combined sublime content and absurd use of footnotes. 1) I could not agree more that teleology leads one to an 'intrinsic value' position... that goes even beyond aesthetic value. 2) I have had the same experience with wishing I was born 300 years ago at the frontiers of science when there was still stuff to be explored...until I realize people will be saying that about our time with respect to the genetic revolution in the biological sciences. 3) I love that quote in Perelandra. I have a partial blog post that I never finished about the intrinsic value of creation beyond human experience as one of Lewis' secondary arguments from that book...but it was mainly argued from a different passage.